The Economy Julep Strainer is a great addition to your bartending kit and it's a must have. Not everyone wants to be picking bits of mint or fruit out of their drink do they? 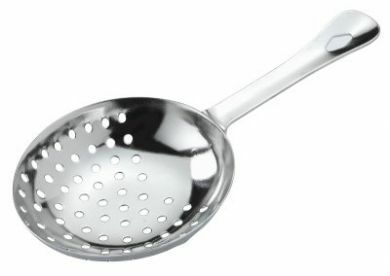 This Julep Strainer is made from good quality stainless steel and is an essential tool for your cocktail making kit. Whilst pouring the liquid out of your Cocktail Shaker, the Julep Strainer just sits under the area where the fluid is pouring out to catch the large chunks! Stops ice pouring into your glass.